Houston outdoor kitchens on your mind? What can a Houston outdoor kitchen do for you? For one it’s about time to enjoy some fresh air and sunlight. Enjoy it while you prepare those delicious meals. Meals for family and friends. No one ever said that a cook needs to be grounded in the kitchen. Grounded while others chat happily away on the backyard wood deck. So, join the social fun right now by taking your cooking outside. Let the savoring smell of your food make this chatty bunch swoon. While you do what you best in your outdoor kitchen. Best Price Outdoor Kitchens, Patios, and Fireplaces! Houston Outdoor Fireplaces and Fire-Pit Pros! Top Screened In Porch and Houston Remodeling Contractor Pros! Houston Deck Covers & Deck Gazebos – Texas Style! Outdoor Kitchen Pros – Ready With Best Price & Best Quality! Call and ask about our outdoor kitchens best price guarantee. Yes, you don’t have to go anywhere else. Because we are the Houston outdoor kitchens professionals that you always wanted to work with. We deliver amazing results. Remember that you don’t have to pay a lot of money in order to acquire the best quality. That’s exactly what we offer! At Houston Outdoor Kitchens we are committed to creating the ultimate outdoor experience. An experience that matches your cooking style & entertaining preferences. The creativity of our Houston outdoor kitchens team will work with you to build the perfect outdoor kitchen. One that captures personality and beauty. Many tend to think that an outdoor kitchen isn’t needed. But obviously they are mistaken… An outdoor kitchen is designed to help you bring in the great ability to cook food outside. All with the astounding convenience and professionalism that you would otherwise have inside. Don’t hesitate and take full advantage of this one of a kind opportunity. 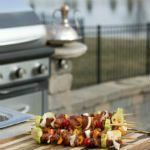 Houston Outdoor Kitchen Pros – You Will be Amazed! We bring you an amazing price, with an amazing set of designs. Designs that will fully change the look of your Houston outdoor kitchen. All while adding in a lot of functionality and professionalism! Don’t hesitate! Take full advantage of this amazing opportunity, you will surely love it! Simply close your eyes and imagine making your meals amidst Mother Nature. You will immediately understand why Houston outdoor kitchens are so coveted. Remember that the outdoor area is a place of relaxation. So why not add in your own touch, & create an outdoor area that will make you proud. What you will like about our services is the fact that they are very easy to use. It can be very hard to find the perfect Houston outdoor kitchens contractor. We are here to help! You can have your perfect outdoor kitchen. Just contact us, & see how easy & affordable a new outdoor kitchen can be! Thinking about adding a stunning patio or deck cover? Maybe building a screened in porch? Houston Outdoor Kitchen Pros stands ready to design the outdoor kitchen you have always envisioned. We also build hearty outdoor fireplaces. Fireplaces that will keep you partying late into the night. Don’t worry about the details. Our team of experts will make sure that your ideas are brought to life. Brought to life in an amazing manner. And you will surely appreciate the results. We are always here to help you with any modifications that you might want. Modifications to make your outdoor cooking area perfect. Just let us know and we will be more than happy to assist you. Don’t hesitate, call about Houston outdoor kitchens now! And don’t forget about Outdoor Kitchen Pro’s deck covers. They are made of the finest wood. They not only blend seamlessly with your exterior design. They also sprinkles a classic and elegant charm to your outdoor environment. Check out our comprehensive outdoor kitchen design services & make sure you leave nothing out. Work with the best contractor like Houston Outdoor Kitchen Pros! We will bring your ideas to life!